First I'd like to explain fleet holding tracks then provide a brief example about it. Each fleet holding has a different number of tracks. There is always the main track which shows the overall progress of the holding, and some sub-tracks. All of them provide bonuses, unlocks, and improve the holding. In order to progress in the main track you need to complete projects for the sub-tracks. Each tier of a sub-track equals 1000 XP for the main track. 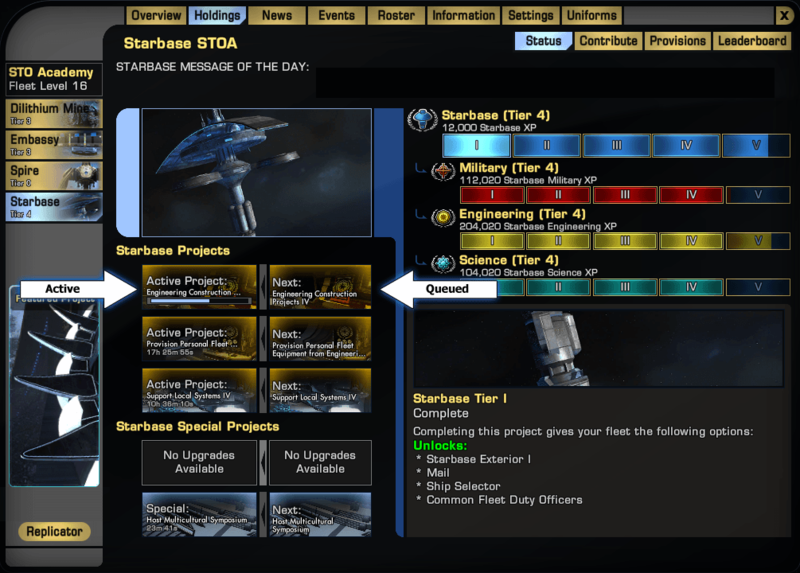 In the example to the left (click it to enlarge), the fleet holding is a Spire. The main track is the Spire. The sub-tracks are Research and Operations. Research is in the progress of upgrading to tier 1. When it completes this fleet will have 1000 XP in the Spire track. 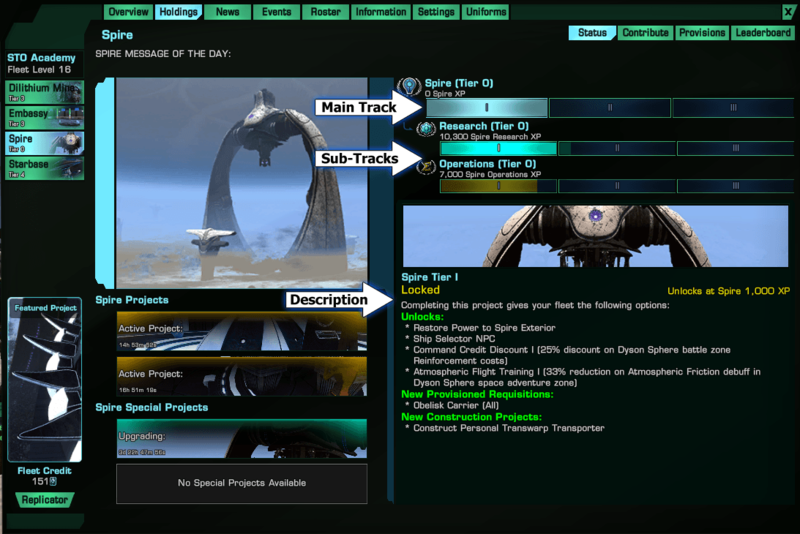 While in game you can click on the various tiers for any track to read a short description of what it unlocks and provides for the fleet. Status - Let's you view the status of the fleet holding. Contribute - Where you contribute to projects. Provisions - A list of all provisions and how many are available. Leaderboard - The list of contributors and how many Fleet Credits they've earned. In this next example we see how to improve holdings. Fleet leaders will start projects which you can contribute to. Contributions help improve the fleet and reward you with Fleet Credits which can be used to buy some amazing fleet equipment. In order to contribute you must have what is required. If you don't then do your best to get it so you can help your fleet. Click on any of the projects that do not have a countdown timer, these are the ones that still need to be filled. Find projects with the Contribution button lit up which means you can contribute to it. Then simply click on the Contribute button, choose the amount you wish to contribute and continue. This is pretty straight forward. Fleet Marks are obtained through various missions. These can be contributed to fleet projects. 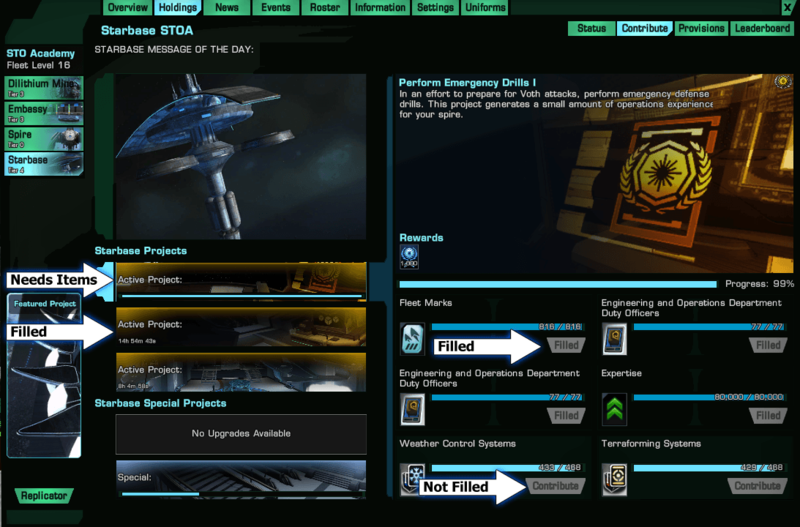 Fleet Credits are obtained by contributing to fleet projects. Use them to buy fleet equipment. Provisions a store's stock. You can only buy fleet equpiment if there are provisions. Fleet leaders must run projects to replenish provisions. In addition to everything above, if you are the leader of a fleet or have the permission to manage fleet projects, your holdings window will look slightly different. You'll notice two columns of projects. The ones on the right are active, the ones on the left are queued. This means that as soon as the one on the right is complete, the right one will activate. When a track needs to be upgraded the upgrade project will unlock and some projects for that track will become unavailable. You cannot cancel any projects, but you can change the queued project before it becomes active. As soon as that upgrade is complete those projects will be available again. There are also provision projects which you can run. These provision the fleet stores so that your members can buy fleet equipment. Provisions are a fleet store's stock. They are added to the store by completing certain fleet projects. If there are no provisions in the store you cannot buy anything from it. Below are tables which list the various provisions for each holding.